Solgar L-Carnitine 1500 mg liquid is a premium blend of free-form L-Carnitine and pantothenic acid that helps support energy and fat metabolism and promotes exercise-recovery. L-Carnitine is an amino acid derivative that is considered to be a conditionally essential nutrient. 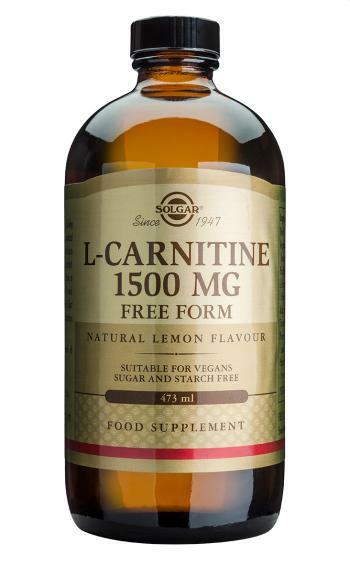 L-Carnitine is necessary for the transport of fatty acids through the cell membrane, into the cell cytoplasm and then through the membranes of the mitochondria where the fats are used to produce energy in the form of ATP. L-Carnitine is also needed to remove the toxic cellular by-products of this process. SHAKE WELL before use. As a food supplement for adults, one (1) to two (2) tablespoons (15 ml to 30 ml) daily, preferably on an empty stomach, or as directed by a health practitioner. EC RDA =- EC Recommended Daily Allowance.